We would like to thank and highly recommend Motorcycle Movers Tirau for the excellent service they have provided to us recently, we feel that they went above and beyond their duty to us. We were constantly kept informed of their progress during the pick up and delivery of the motorcycle from the North Island to the South Island. We have no hesitation in recommending their great service, they have been an excellent firm to deal with, friendly yet professional and getting the job done in a very timely and most satisfactory manner. 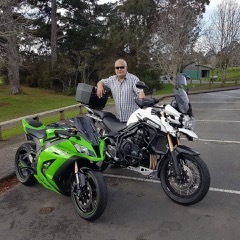 I reached out to six motorcycle moving companies I could find in NZ, about getting my new bike from Auckland down to Gisborne. Five of them said that Gisborne was out of their route, or they only go depot to depot and that they couldn't help get it here. While Motorcyle Movers Tirau were able to adjust their route on their upcoming trip and fit in my bike. There was fast communication keeping me updated from Jo. The bike was delivered fast and on schedule, and the driver, Allan was extremely nice and kind and very professional. Would use this company again and recommend it to others - one happy customer here! This was the second time I have used Motorcycle Movers and each time the shift has gone perfectly; nice people to deal with who keep in touch re pick-up and drop-off times, and are flexible. I am very pleased with the service. The price was very competitive, the bike was delivered punctually and the driver was friendly and helpful. I will have no hesitation in calling you again. -Communication: Excelent, clear and accurate. -Price: Average, same as any other company will ask for. -Overall experience: Simple communication, in just a few steps this was sorted. The best part of this was Alan, a very friendly guy that gave me a good time talking about bikes and experiences while he unloaded my bike. Please let him know that Santiago the Argentinian is sending greetings. The bike traveled safe and covered. I would recommend this company to anyone. Thanks guys! Thank you for delivering my beautiful big bike right to my garage. Thanks also for organising to rendezvous at Springs Junction with the seller, this saved me a lot of money, the other companies just are not as flexible as you. Will certainly use you guys again and recommend you to anyone else. Your service was awesome, although the delivery was delayed I was continually kept informed of the new time of drop off. Excellent value for money, I will be using the service again and will recommend you to mates. You guys are bloody awesome! I used Motorcycle Movers Tirau and I found them (on to it) good communication and easy to deal with. A bit flexible which was perfect for the move. I'm happy and will use them again. I found Motorcycle Movers Tirau very easy to deal with. A lot of transport companies keep you in the dark with estimated pickup and drop off times but you guys were awesome excellent communication. Price was very reasonable too, would recommend your company to anyone. Pity you don't transport cars would have definitely used you for that too. I have to say I've used another company in the past but am glad I gave you the opportunity as you guys are pick of the bunch in communication and service by miles also price point is way better and it was great to have Allan deliver the bike he is passionate about the bikes and the business and I wish you the very best for the future I have no hesitation in recommending you to anyone. Everything about you people was great. Kept us informed on time arrangements. Very helpful and obliging in every way. Thanks a lot.